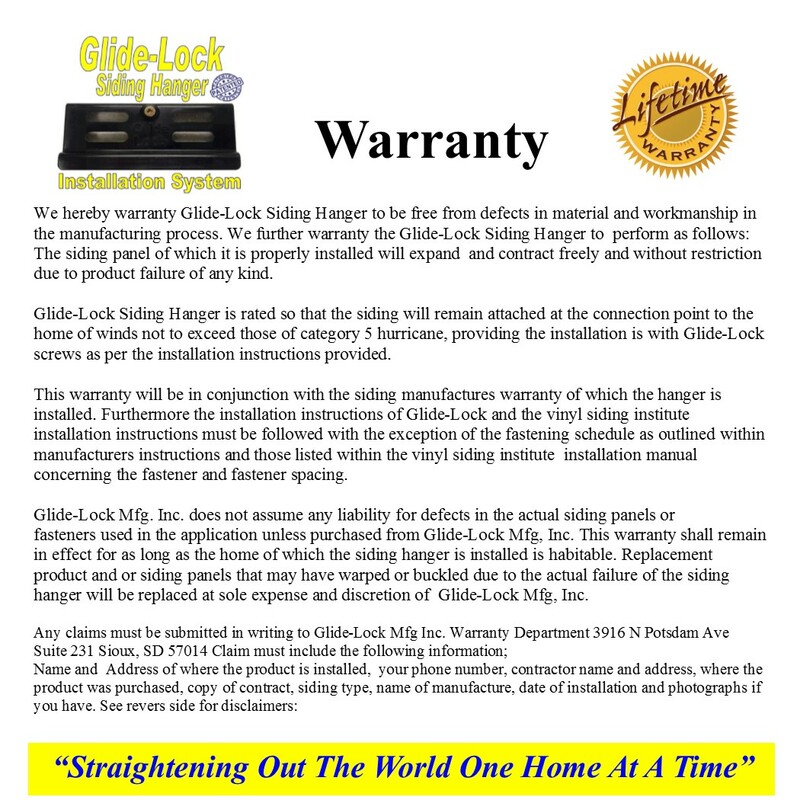 Glide-Lock Siding Hanger Installation System - Glide-Lock Mfg, Inc.
Glide-Lock Siding Hanger Installation System adds life, value and the greatest curb appeal to vinyl siding. The Glide-Lock Siding Hanger Installation System is patented cutting edge technology that allows vinyl siding to expand & contract freely, eliminating warping & buckling while increasing wind load & curb appeal.The #1 dissatisfaction with homeowners across the nation is the warping and buckling associated with vinyl siding. For over 60 years vinyl siding is attached the same way leaving the empirical evidence of “bad” vinyl siding everywhere. Eliminate the installation errors associated with vinyl siding by using the patented & powerful Glide-Lock Siding Hanger. The Glide-Lock Siding Hanger is light-weight, easy to use, effective, proven to perform & approved by third party testing & laboratories. The Glide-Lock Siding Hanger Installation System can be attached with over 98% of the vinyl siding on the market today. Discover the full benefits of vinyl siding with the Glide-Lock Siding Hanger Installation System. The Glide-Lock Siding Hanger Installation System will allow your siding to expand and contract freely because there are NO fasteners in the vinyl siding panel itself. The Glide-Lock Siding Hanger locks into the top of the siding panel and allows the siding to move like a train on the track. The Vinyl Siding Institute and vinyl siding manufactures installation instructions specifically states that each fastener must be installed directly in the center of the nailing slot and that a space of 1/32″, (that is the thickness of one thin dime) is left between the fastener head and the vinyl for expansion and contraction. Evidence of failure to doing so is in your neighborhood. Look around within a half mile in any direction and you will find “bad” vinyl siding. 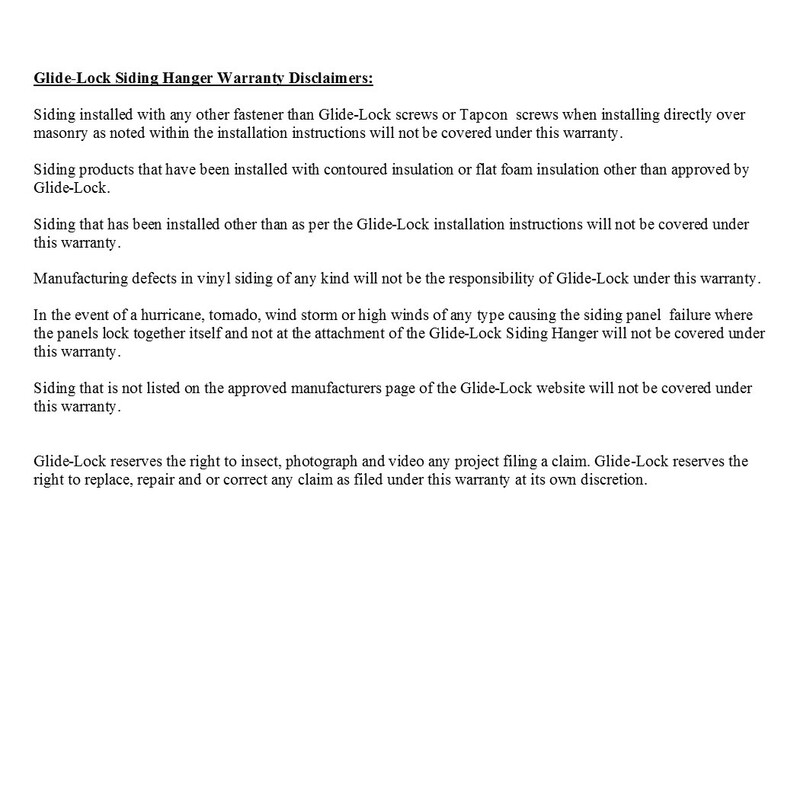 Glide-Lock provides a simpler solution. It’s time to act now with the Glide-Lock Siding Hanger Installation System to instantly make your siding perfect with 100% peace of mind installation & become the envy of the neighborhood. The Glide-Lock Siding Hanger Installation System installs with horizontal, vertical and diagonal applications. Use with standard non insulated siding, flat back foam insulation or with drop in insulated siding. We also offer screw fasteners and custom fit contoured fully backed insulation to fit all manufactures siding. Eliminating the warping & buckling to have your vinyl siding perform the way the siding manufactures originally intended can only be achieved with the Glide-Lock Siding Hanger Installation System.